The Vintage cuvée is aged, on average, for four years in Louis Roederer’s cellars and left for six months after dégorgement (disgorging) to attain optimal maturity. The dosage is 9 g/l. A continental, sunny year with a real winter that was very cold and dry followed by a glorious sun-filled summer and almost no rain in August and September. All this meant traditional vine growth, excellent health and remarkable grape ripeness for the production of fruity and delicious wines. 2009 is an obvious addition to the select group of brilliant and accomplished Champagne vintages with a light, sunny character. Fascinated by the diverse aromatic qualities of the Pinot Noir grapes in Champagne, Louis Roederer uses the structure and power of the Pinot Noir from the Montagne de Reims to create its Vintage. Exposed to the north-east, the grapes mature more slowly and produce wines that are sometimes rough and closed at the beginning of the ageing process, but their character intensifies and becomes more refined through ageing in wood over long periods. 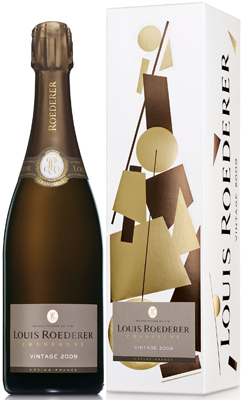 In 1850, Louis Roederer acquired 15 hectares in the Grand Cru vineyard of Verzenay in order to master the cultivation of the grapes in this cuvée.